How to add a new floor. 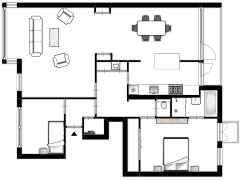 How can I add a second floor for my bed rooms? I’ve pressed the tool icon and press make a new floor but it won’t appear. What do I do? I checked your plan and it looks like you succeeded, right? I see 2 floors in your plan.